Fantastic news! The twenty-first entry in our 2016 Travel Highlights competition is from Bob Manning, who was our 2016 Travel Stories competition winner. If you haven't read his evocative winning story yet then please check it out here before you read his stunning travel highlight entry. The First Tapa Is All It Takes! Hesitating at the door; Stopped in my tracks by the bedlam within. I peered through the smog. The congested bar stretched into inconspicuousness. Pinpointing a space amongst the revelers, I cut through the sultry atmosphere, kickin-up the debris of discarded delights. I clung to the glutinous counter. The barman’s raised eyebrows questioned me. With brutal efficiency he slopped a small beer in front of me, whilst summoning “the first”. An old crone delivered a small plate of orange gunge. Temptingly dangerous. I took to writing, It's a therapy that vents the part of the brain that previously demanded numbing. I studied, and qualified as an Addictions Counselor. I met and married my soulmate Gerda, together we farm in the natural beauty of the Alpujarra region of Granada, Spain, we also run retreats for people who struggle on their path, Life is good. It is a great honour to be able to publish the twentieth entry in our 2016 Travel Highlights Competition - it is from Sandra Staas. Enjoy her wonderful highlight. Driving around Washington D.C. for the first time in 8 years, going 70 miles an hour in the slow lane. Lost. “We need to take the George Washington Parkway.” I search hopefully for signs. Sandra Staas grew up in Scotland before moving to Spain. She resides in Pennsylvania and ​​taught Spanish as adjunct faculty for many years in the Pittsburgh area. She has written and photographed numerous photo tours, and her articles have been published in several journals/newspapers. She recently has self-published three memoirs and one short story collection on Kindle. Hot off the Lake Iseo ferry, the sun peeps with me, through a small window where hangs a hammock. This is the place I’m seeking. In the cool interior sits a lone worker, an artist of threads, at a sewing machine as wide as my desk. He doesn’t raise his head, but reaches for coloured reels of string. If he can make fisherman’s nets, or nets for a tennis court; Wimbledon they say – then he is the man for me. I buy a bunch of string shopping bags, one in every colour. Mission accomplished. After a slight lull in entries for the 2016 Travel Story Competition, it is great to welcome back Lin Middleton with her second entry. Lin, and her husband Ken, have recently been travelling in the USA and her highlight is therefore Texas themed. I hope you enjoy it as much as I have. “A 72oz steak , baked potato, salad, shrimp cocktail, bread roll” Ken replied. We were at the Big Texan Restaurant, Amarillo – home of the 72oz steak challenge. People sat at the table. An hour to eat their meal. One man remained with just one more forkful. He gave in. His green pallor told his story. Others tried, only to be defeated. We weren’t going to see anyone win the battle tonight. “A woman holds the record, eating three steaks in 20 minutes” said Ken. “That's more than 13lbs of meat!”, Ken replied, reading my thoughts. Lin is from England but has been living in Adra in southern Spain since 2008 with her husband. She has worked in the travel industry for over 30 years in the aviation sector for the conference and incentive travel market. 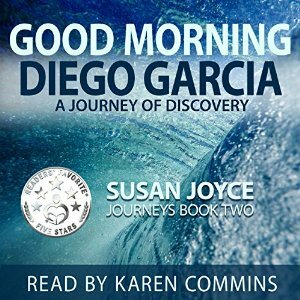 Guest Blog: Susan Joyce & Good Morning Diego Garcia! It is a real pleasure to be able to feature this guest blog from Susan Joyce. 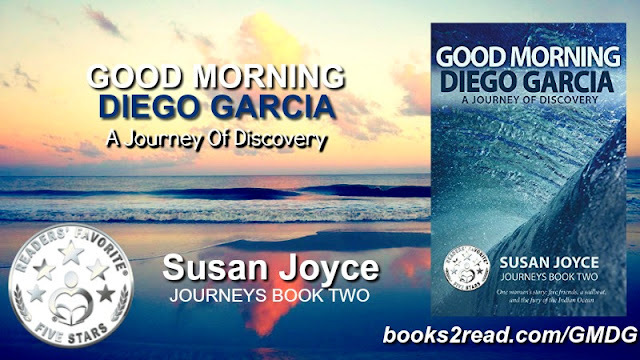 Her newly released memoir Good Morning Diego Garcia! is currently on offer for only 99p/99c. There are just over three weeks left to enter your travel highlight of 50-100 words. All you need to do is to e-mail your 50-100 word travel highlight, with a short bio and optional photo to fd81@assl.co.uk. We’ve had some fantastic entries so far that you can read on my blog here. If you’ve already taken part, don’t worry, you can submit up to three highlights. It is a great privilege to welcome back Syd Blackwell with his second poetic travel highlight. I think we may see a third before this contest is out! Anyway, in the meantime enjoy Syd's latest entry in the 2016 Travel Highlights Competition. At age 60, my wife and I retired to Uruguay, where we will soon have lived for a decade.Innside Stories is my first published book. I have extensive writing experience in Canada with other publications. In Uruguay, I wrote 75 articles for a now defunct online magazine called Ola Uruguay. We live in Villa Argentina, a suburb of Atlántida, on the coast of Uruguay. We have five dogs. A warm welcome to the latest entrant in our 2016 Travel Highlight Competition - Susan Brown. Susan modestly claims that "I have never done anything like this before". We stepped off the gondola into a different world. From the hustle and bustle of the town we had arrived at an area with stunning views and crisp, fresh air. Exploring the area we came across some beautiful wood carvings of animals and birds. In the hills we could see brown bears wandering around and eagles gliding across the sky. The cafe was a welcome sight after a few hours walking. We had coffee as we watched the sun set over Vancouver and the Pacific ocean. Amazing experience! My name is Susan Brown. I live in Hanchurch, Staffordshire with my husband Jeff and our west highland terrier, Basil. I worked as a nursery manager for many years and then as a lecturer in childcare at Newcastle Under Lyme College. I am now retired. I am really pleased to be able to feature a second travel highlight entry from Mike Cavanagh. Did you know that each author/writer/poet can enter up to three highlights in this year's competition? "​This one was easier - maybe I'm getting the hang of it! Thanks actually for stirring up a very pleasant memory. The old shepherd kept us chatting away for 15 minutes, telling us where to go, who to contact, who not to deal with, about his cousins, other Cavanaghs he knew of, etc etc. It was a wonderful lesson in making an attempt. We eventually parted, both laughing and waving like long lost family." Lost. Some sheep track in south-west Ireland. We’d past an elderly, local shepherd with his collie on the way in. I’d waved hello; he’d largely ignored us; just more tourists. U-turning at a locked gate in the dry-stone wall, we headed back down the track. The shepherd stood aside as we neared. I stopped and asked directions. He answered briskly, pointed vaguely. “Go raibh maith agat!” – ‘Thanks’, I said. Well, a few words – but his smile beamed. Not tourists now, but a long lost relative, to be sure, to be sure. Mike Cavanagh is now in his sixties and has no idea how that happened. He lives with his wife, Julie, and two black cats in Bateman’s Bay, New South Wales, Australia. Three adult children, mostly left home, complete the extended menagerie. The house Mike and Julie live in is quirky and in need of regular maintenance, as are its owners. Mike writes poetry, plays guitar and composes music, is doing a PhD in Zoology, and spends far too much time playing computer role playing games. None of these very well, necessarily, but he does them. Robert Fear is the guest author today on Sarah Jane Butfield's blog at Rukia Publishing. He shares some personal family photographs and gives us a look behind the scenes of Exclusive Pedigree.